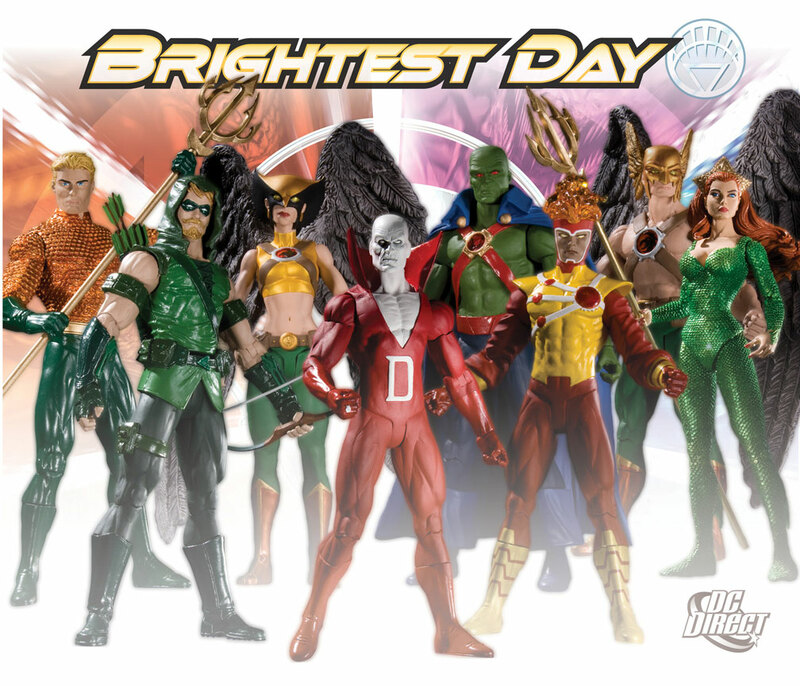 DC Comics announced yesterday the release of several Brightest Day action figures for 2011. Good news – Firestorm made the cut! Below is a picture of the action figure coming our way from DC Direct. Overall this is a good looking figure! 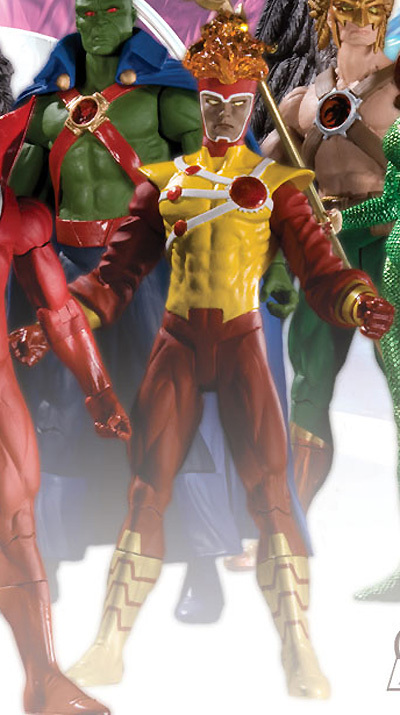 I see that Firestorm’s skin tone is definitely darker than the white heroes in this figure assortment. They are clearly demonstrating here what we’ve suspected, that Firestorm’s current skin tone is somewhere between white and black. I believe this is a decent compromise for Ronnie and Jason fans. For me personally, there are three things I’d change about this figure. First, I’d work on making the white atomic paths on his shirt and headgear either translucent or highly reflective to imply glowing. Second, I’d make the headgear around the eyebrows more prominent like in the Brightest Day drawings by David Finch, and Scott Clark & Dave Beaty. The comic drawings almost make Firestorm look like he’s got a caveman brow with the prominent headgear ridge. Third, I’d figure out how to include the fiery “Kirby Dots” in Firestorm’s hair. To better explain the three changes I outlined, see the image below. Also, just to be clear, I still think this is a great figure. I’d just change a few things if it were up to me. Below you’ll find all the figures announced for the first two waves. We’re not sure at this point in which wave Firestorm will be. If he’s in the first wave, then his figure is due in March. Click the image to enlarge. For more information on these figures visit the DC Comics Source Blog. Also, a huge thanks to Andrew LoVuolo from Graphic Illusions Studios for sending this information my way. Thanks, Andrew! I can’t wait to add this figure to my collection! Posted in: Brightest Day, Firestorm #08: Brightest Day (Ronnie/Jason), News, Toys. It really is a cool action figure and a great looking assortment. We were discussing what might be in store for Firestorm given the announcement of this figure on our site earlier this week. There’s deffinately something about the current costume I don’t like, but i can’t for the life of me work it out. Just feels wrong. That’s an awesome Mera figure though.